Hotels, Bars, Pubs and Clubs | Melbourne Trivia Co.
(See Upcoming Events for times and places of our current hotel trivia venues). Pub Trivia is still incredibly popular in Melbourne and Melbourne Trivia is an experienced company in the field. Melbourne Trivia Company provides fun and dynamic trivia nights to a number of fantastic Melbourne area pubs, hotels and bars. If you are interested in us providing trivia at your pub/hotel or would like more information, please contact us. A regular trivia night can bring new customers into your bar on a quiet night of the week, building a regular clientèle of players. 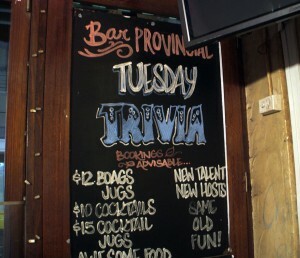 Trivia can also broaden the way your local community sees your venue. It is not only good for business but entertaining too. Our style is sophisticated, relaxed and up to date, with an emphasis on laughter. Questions cover music, sport, popular culture and general knowledge. We also send a weekly email to regulars that includes an “Advance Question”. The night lasts about 2 hours. We provide everything needed for the evening – the host, sound equipment, answer sheets, and pens. To discuss having Melbourne Trivia present a weekly trivia night at your venue contact us and we will come to you to talk about your specific requirements.